• For quantitative determination of heme and evaluation of drug effects on heme metabolism. • Heme is one important member of the porphyrin family. It is synthesized in both mitochondria and cytoplasm, and is a key prosthetic group for various essential proteins such as hemoglobin, cytochromes, catalases and peroxidases. Heme determination is widely practiced by researchers of various blood diseases. Simple, direct and automation-ready procedures for measuring heme concentration are becoming popular in Research and Drug Discovery. BioAssay Systems QuantiChrom™ Heme Assay Kit is based on an improved aqueous alkaline solution method, in which the heme is converted into a uniform colored form. The intensity of color, measured at 400 nm, is directly proportional to the heme concentration in the sample. The optimized formulation substantially reduces interference by substances in the raw samples and exhibits high sensitivity. 1. Does the Heme Assay kit DIHM-250 detect heme bound to hemoglobin or only heme alone? 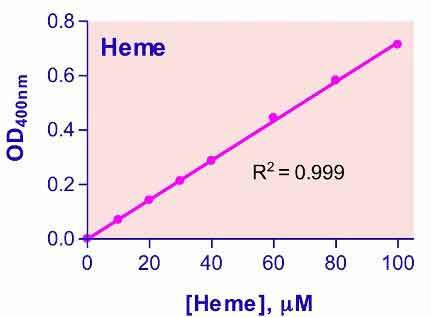 The heme assay detects the total heme content in the sample, including the heme in hemoglobin. 2. Does the heme assay detect β-hematin (malaria pigment) / protoporphyrin? We have not specifically tested it, but it is highly likely that our heme assay will detect β:-hematin and protophorphyrin with the same efficiency as heme, and that it is not possible to distinguish between the variants.